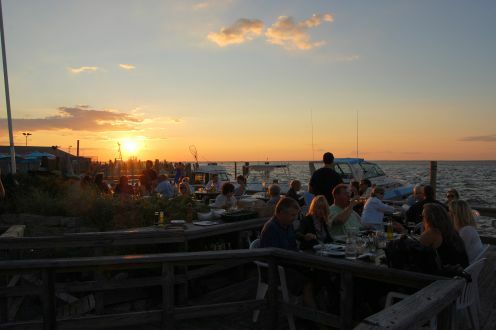 The Hideaway serves excellent food in a beautiful bayside setting. The service is good and the prices are fair. I highly recommend this restaurant. Have you ever been to Houser’s Bar, that spartan little place on Evergreen Walk in Ocean Beach? If you have you’ll understand why I’ve always been a little skeptical of The Hideaway Restaurant, which is part of the same operation. Houser’s is a very casual local place complete with bare plank floors, dartboard and pool table. I’ve come here in my bathing suit, shirtless, barefoot, and covered with sand, and still felt a little overdressed. So, when I decided to try the Hideaway as part of the Taste of Fire Island dinner package, it was not without some concern that the restaurant might not be much different than the bar. In spite of the good things I’ve heard about The Hideaway, I honestly didn’t know what to expect. What I discovered is that these two businesses are indeed completely different. The Hideaway is casual in all but their food, which we found to be simply outstanding. After arriving on the 5:35 out of Bay Shore, our favorite boat, we were seated in a beautiful outdoor dining area overlooking the Great South Bay. 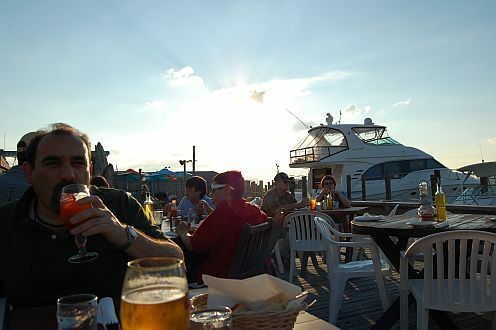 Like most restaurants in Ocean Beach, the water views here are somewhat obstructed by dockage for those arriving by boat, but we still had a nice view of the setting sun and plenty of fresh air. Indoor dining room with water views and lots of air. One of the nice things about the Hideaway is the separate dining area for large parties. This is outside, but at a lower lever and surrounded by stone which helps keep the noise down. There was a large family gathering in progress while we were there and even though we could still hear the screaming kids, the noise level was at a very acceptable level. There is also a large, airy and bright dining room inside for rainy days and those wanting to limit their exposure to the sun. We started with a round of beer, Stella Artois for Karilyn and a Sam Adams Summer Ale for me, to knock off the thirst we built sitting in the hot sun on the ferry. There’s no tap beer here which was somewhat disappointing, but the bottles were served nice and cold. There's nothing like an ice cold beer with the blazing sun on my back. pleased to see some specialty cocktails on the menu. 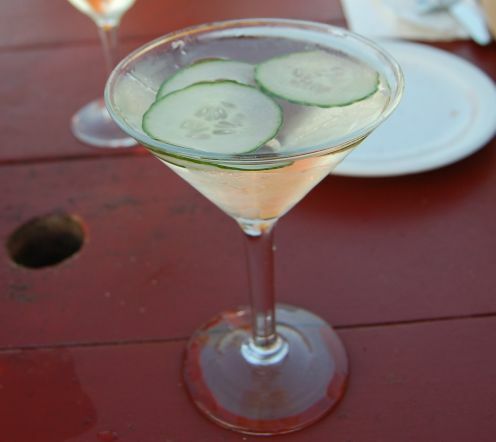 Being a fan of Hendrick’s Gin I couldn’t resist ordering something called The Hendrick’s Experience, a mixture of Hendrick’s, muddled cucumber and a sweet liqueur. The cocktail was crystal clear, ice cold, and nicely garnished with 3 cucumber slices floating on top. The ingredients worked well together to bring out the cucumber and rose in the Hendrick’s Gin, but this is one very sweet drink and I would have been better off having it for desert. While I had my cocktail Karilyn had a glass of sauvignon blanc from a winery in New Zealand which she said was very good. The relatively short wine list at The Hideaway covers the basics, but there are no long Island wines which I always find very disappointing. We ordered from the Taste of Fire Island prix fixe menu which offered baked local clams or tempura vegetable appetizers. My baked clams were very good. They weren’t chopped beyond recognition and the tiger shrimp stuffing added a nice secondary flavor. This was a nice change from the standard breadcrumb and parsley stuffing so commonly served. 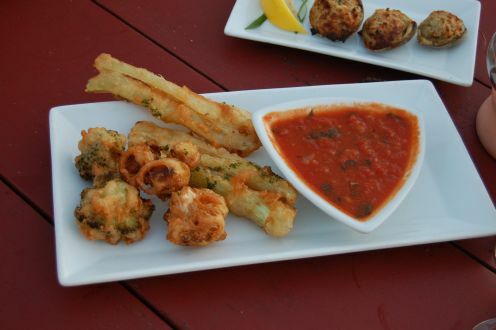 Karilyn had the tempura vegetables which were served with a tomato basil dipping sauce. The vegetables were hot, crisp and not greasy. This was a well made tempura that really hit the spot. 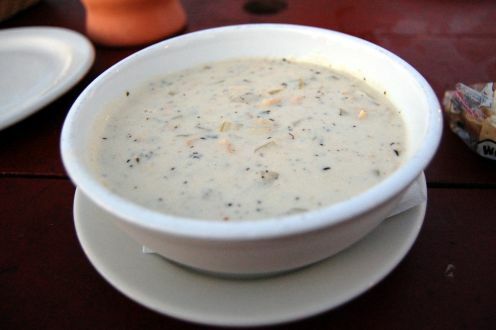 Excellent New England clam chowder. Our second course was New England clam chowder. This was by far the best chowder we’ve had on Fire Island this summer. A bowl full of flavor would be the best way to describe it. Everything about it was perfect. The clams were tender, the consistency was just right, and a host of other ingredients made this quite enjoyable even though I am still struggling to figure out why, in the heat of summer, restaurants are serving what many consider a wintertime dish. The Hideaway’s third course offerings were salmon, chicken and steak. Everything sounded good and this was actually a tough choice for me. Fortunately Karilyn ordered the chicken which was one of the things I wanted to try, so my choices came down to either salmon or steak. A mental coin toss landed salmon in my plate and I did not regret it. 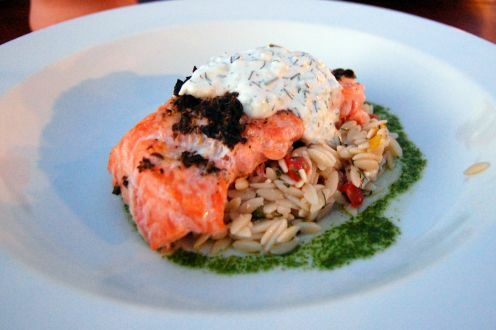 Salmon topped toasted oregano and tzatziki over warm orzo salad. The salmon was cooked on the rare side, as it should be, and topped with toasted oregano and lemon. On top of that was an excellent tzatziki. Taken together in one bite the salmon, oregano and tzatziki were a perfect combination. The orzo was also very good, and then even better after it had soaked up all the juice from the fish. Chicken paillard. We're ordering this again. Karilyn’s chicken paillard was amazing. 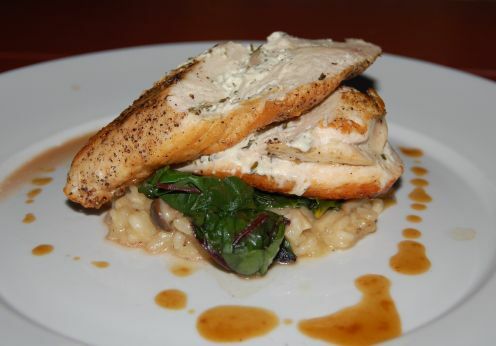 It was stuffed with boursin cheese and served over Swiss chard and a wild mushroom and goat cheese risotto. The chicken was seasoned and baked to perfection. As much as I was enjoying my salmon, I was almost sorry I didn’t order the chicken. But that’s okay. I enjoyed what was left the following day for lunch. The service was very good. Our waiter was polite, but seemed a little harried. We saw him waiting tables both inside and out and I could only assume that The Hideaway may have been a little short staffed the night we were there. He did his best and I give him credit for that. After a skeptical start The Hideaway is clearly now one of my favorite Fire Island restaurants and I’m already looking forward to next season when we can dine here again. Boaters: Dock space costs about $15/hr and the first 2 hours are free. Be sure to call ahead for reservations. Look for the building with Houser's Hotel painted on the roof just west of the water tower. 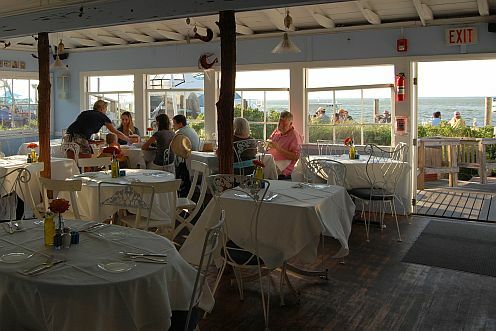 The Hideaway is located in between 2 restaurants that I highly recommend: Island Mermaid and Mathew's Seafood House. More things to do in Ocean Beach and Fire Island.